Dora Hogan was singing a grateful tune after a friend in her choir said she could get free smoke alarms installed in her Milwaukee home. American Red Cross volunteers who made the installations were grateful, too. American Red Cross volunteer Jordan Davis, right, talks over a home fire escape plan with Dora Hogan, left, & Alisa Jones. Hogan, a grandmother living on the west side of the city, said a smoke alarm in her living room had fallen from her ceiling, which made it difficult for her to replace. With family – including her beloved grandchildren – visiting often, Hogan found it essential to reach out to the Red Cross on their standing offer to provide free smoke alarms to those who need them. Hogan made an appointment for the alarms (click here to find out how) and two Red Cross volunteers came to check out her home fire safety needs. Along with the living room replacement alarm, Red Cross volunteer Jordan Davis found another alarm in one of the bedrooms with a 1997 expiration date. A few additional alarms were in order, too, posted in important spots in the home to give Hogan peace of mind. Davis tested the alarms and, with a beep, everyone knew that the home was a safer place. Along with the alarms, Davis sat with Hogan and Jones to review fire safety tips and a fire escape plan. With these plans, in case of a fire, Hogan’s family will know exactly what to do and how to stay safe outside the home. In addition to installing smoke alarms, Davis volunteers on the Milwaukee area Disaster Action Team (DAT), a role that puts him in a place to comfort and help families involved in many local home fires. Davis said smoke alarm and home fire escape plan events like one coming up April 27 in Milwaukee are “crucial” when it comes to family preparedness. “Responding with DAT in the aftermath of a home fire to provide comfort and resources to community members can be extremely challenging – and especially when one learns just how many residences in Milwaukee do not have working smoke alarms. Installing smoke alarms before a fire occurs, however, truly brings my service experience with the American Red Cross full circle,” Davis said. Sign up for your free smoke alarm and home fire escape plan by entering your information at GetASmokeAlarm.org or by texting the word “Alarm” to 844-811-0100. For Brittany, it happened at the gym. Gagandeep and Chetna were on vacation. Leroy was volunteering. Brittany Sabin, center in red, gave life-saving CPR to a man who collapsed at her gym. Here, she poses with friends and family during the 2018 Brave Hearts awards in Menomonee Falls. Acts of heroism are all around us, every day. The American Red Cross of Wisconsin celebrates those heroes at three events each year. We need your help to identify outstanding heroes in our community at these three Wisconsin events: Evening of Heroes in Wisconsin Dells, Heroes Breakfast in Eau Claire, and Brave Hearts in Milwaukee. Whether they’re stepping up during a medical emergency to provide assistance or helping others through a lifetime of volunteerism, heroes reflect what is best about our community. Leroy “Buzz” Thompson consoles a fellow veteran as part of his volunteer efforts, one of the reasons he was chosen for an award. Eligible counties: Adams, Clark, Columbia, Crawford, Dane, Florence, Forest, Grant, Green, Iowa, Iron, Jefferson, Juneau, La Crosse, Lafayette, Langlade, Lincoln, Marathon, Marinette, Menominee, Monroe, Oconto, Oneida, Portage, Price, Richland, Rock, Sauk, Shawano, Taylor, Vernon, Vilas and Wood counties in Wisconsin and Houston County, Minnesota. Eligible counties: Ashland, Barron, Bayfield, Buffalo, Burnett, Chippewa, Dunn, Eau Claire, Jackson, Pierce, Pepin, Polk, Rusk, Sawyer, St. Croix, Trempealeau, and Washburn. 2018 honorees Chetna Mangat, at podium, and Gagandeep Singh used their backgrounds as doctors to save a life while on vacation. Eligible counties: Dodge, Kenosha, Milwaukee, Ozaukee, Racine, Walworth and Waukesha. The American Red Cross of Wisconsin is accepting nominations for 2018 Hero Award recipients. Each year, the American Red Cross recognizes everyday heroes in our community at three events in Wisconsin: Evening of Heroes in Wisconsin Dells, Heroes Breakfast in Altoona, and Brave Hearts in Milwaukee. Our three events recognize individuals who have done extraordinary deeds in the community! Whether they’re stepping up during a medical emergency to provide assistance or helping others through a lifetime of volunteerism, heroes reflect what is best about our community. If you have any questions, please contact McKenna Olson at mckenna.olson@redcross.org. Newspaper to Co host: HISTORIC FUNDRAISING CONCERT TO BENEFIT DISASTER VICTIMS featuring Multiple Grammy Winner and Living Legend Eddie Palmieri & his Latin Jazz Ensemble in a unique once-in-a-lifetime concert performance with local salsa musicians and a special appearance by Afro-Puerto Rican Jazz Virtuoso Dr. William Cepeda direct from Loiza, Puerto Rico. MILWAUKEE, Wisconsin (October 13, 2017) – UMOS, together with 12th District Alderman Jose G. Perez, and Publisher Victor Huyke will welcome Grammy Winner, Music Icon and Living Legend Eddie Palmieri & his Latin Jazz Ensemble in a special benefit performance to raise funds for victims of the natural disasters in Puerto Rico and Mexico on Saturday, October 28, 2017 10:00pm at the Potowatomi Hotel & Casino- Woodland Dreams Ballroom, 1721 W. Canal Street, Milwaukee, WI 53233. ALL ticket proceeds will be donated to charity thanks to the generosity of Mr. Palmieri, his sidemen, and all of the participating artists and volunteers. The recent catastrophic natural disasters in Central America and the Caribbean have directly impacted friends and families of many residents of Milwaukee County and Southeastern Wisconsin. An important humanitarian effort to aid victims has emerged from high profile musicians who are donating their time, talent and artistry to provide a dynamic entertainment experience while generating much needed monetary funds. The City of Milwaukee was honored to be the recipient of legendary musician Eddie Palmieri’s offer to donate 100% of his services on a precious Saturday evening time slot together with local and regional musicians in order to send aid directly to victims. Mr. Palmieri, winner of 10 Grammy Awards, an NEA Jazz Master Award-America’s highest honor for lifetime achievement in Jazz, is currently on a national tour entitled: “EP @ 80” celebrating his 80th birthday with innovative new music and a selection of classic hits most of which have become anthems throughout the US, Latin America, Europe and Asia. A volunteer committee of artists, elected officials, educators, and community activists quickly mobilized to produce and market the event. All three event co-hosts have a distinguished record of providing outstanding leadership and support to underserved communities. UMOS, a leading nonprofit community based advocacy agency has generously offered to support this humanitarian fundraiser and concert which follows its acclaimed annual Hispanic Awards Banquet scheduled to take place earlier that evening in an adjacent ballroom. The Palmieri Concert will take place promptly at 10 p.m. in the Woodland Dreams Ballroom of the Potowatomi Hotel & Casino, 1721 W. Canal Street, Milwaukee, WI 53233. Advance ticket purchase is highly recommended. Advance tickets available online at: www.eddiepalmiericoncertforprmx.mivoz.com. Donations will also be taken at the door and a select number of Special Discount Coupons will be available on a first come- first served basis to all patrons who attend the UMOS Hispanic Awards Banquet. A VIP package is available with premium seating and perks which include a private meeting with the artists, and signed poster or CD. All proceeds will go to the American Red Cross whose representatives will be on-hand to meet and share information about their relief efforts. It is anticipated that one or two actual Red Cross volunteers who are serving currently in Puerto Rico will be on hand to describe first hand accounts of relief efforts on the island. Ticketing // Admission: Seating capacity is limited. Advance ticket purchase is highly recommended. Minimum advance donation is $40.00. Special VIP package $150.00 includes premium reserved seating, private meet and greet with artists and complimentary signed CD or Poster while supplies last. ONLINE TICKET PURCHASE AT: www.eddiepalmiericoncertforprmx.mivoz.com. Last week, the Wisconsin Region conducted our 4th annual Disaster Training Conference. Though the conference was held on the shores of Green Lake, attendees paid little attention to beautiful autumn scenery outside. The 183 attendees, Red Cross volunteers and staff from Wisconsin, Minnesota and Illinois, enjoyed four days of learning, sharing and networking. The broad range of classes provided opportunities for brand new volunteers and seasoned veterans. The newest volunteer had been with the Red Cross for only two days and several in attendance had more than 20-years of service. Classes were offered to provide instruction on delivering the Red Cross mission, supervision & leadership along with diversity & inclusion. Workshops built upon classroom instruction and provided hands-on opportunities to set-up a shelter, conduct damage assessment and manage a disaster relief operation. On Wednesday night, Red Cross volunteers partnered with the Berlin Fire Department to make homes in Berlin safer. They visited homes and provided smoke alarms testing, free smoke alarm installation, home evacuation planning and fire safety tips. 25 homes were visited and 69 smoke alarms were installed. Community outreach like this is happening around the state and more than 10,000 smoke alarms will installed this year alone! By all reports, the Disaster Training Conference was a wonderful success! It was wonderful to see so many Red Crossers come together to learn and celebrate together. Plans for next year’s conference are already underway. We hope to see you there! Congratulations to Anne-Marie McDonald, the April 2016 Red Cross Volunteer of the Month. Anne-Marie joined the Red Cross in 2005 explaining, “After seeing how much my husband enjoyed volunteering with the Red Cross I followed his lead,” and eleven years later she continues to support the Red Cross by giving of her time and talent. She ensures Blood Donors receive a warm smile, answers to their questions and have a fantastic overall experience. Disaster clients get her full attention during local disasters, national disaster response and through preparedness outreach. And if that doesn’t keep her busy enough, recently Anne-Marie took on the role of Community Volunteer Leader (CVL). June 24, 2014 the American Red Cross of Northeast Wisconsin hosted our spring Celebration of Support event. We had 260 staff, volunteers, blood donors and community members attend this annual event. Every year we honor a few volunteers who have gone above and behind. Here are their stories. 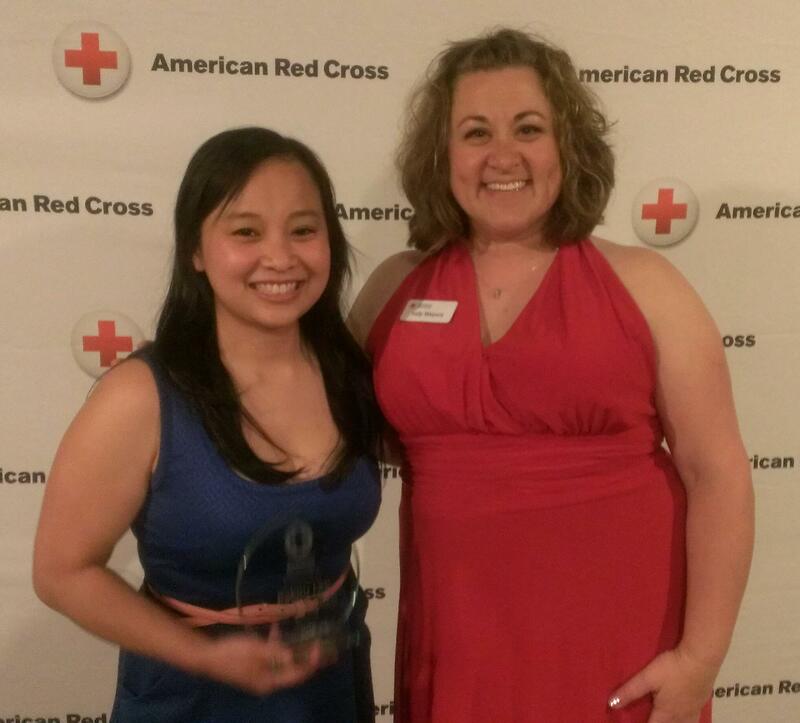 (l) Pakou Lee, Rookie of the Year with Jody Weyers, Volunteer & Communications Director. The American Red Cross has so many stories to share of the amazing generosity of our volunteers, donors and the great work we do in the community. It is a gift when you come across a volunteer who has the talent and skills to capture these stories to share with the public. Pakou Lee is vital to the public affairs team. She is involved with writing stories about our services and her experiences and then sharing those on our blog and other social sites. She updates our Northeast Wisconsin Facebook page and Twitter account daily promoting local blood drives and campaigns. She volunteers at many of our special events assisting with promoting that event through social media or helping where needed. For the past two years she has assisted at the Packers 5k, along with bringing her nieces to help, our Dancing with Our Stars kick off and many fundraising events for our Star Dancers. Pakou has taken training classes in public affairs to gain additional knowledge and did her first live television interview as a Red Cross spokesperson this year. Through her volunteer experience, she received a promotion with her employer working on their social media team. She has a wonderful talent of being able to draw people in with her words. It is for her dedication and commitment to sharing the Red Cross story that honored Pakou Lee with the Rookie of the Year Award.